ithlete 2.3 supports Bluetooth Smart on Android – available now! Following the latest release from Google providing native Bluetooth Low-Energy support as part of its operating system, we are delighted to announce that ithlete now supports Bluetooth Smart on Android. The ithlete v2.3 update is available through Google Play for compatible devices. Please note: This requires a combination of Bluetooth Smart hardware (Bluetooth v4.0 LE chipset) being present in your mobile device and the latest operating system, Android 4.3 or above. To check if your device is compatible go to the ithlete ‘Edit’ screen and see if the ‘BLE’ (or ‘Bluetooth’) radio button is enabled. If you are unable to select this option, unfortunately at this current time your device does not support Bluetooth Smart. To celebrate the new release we are offering 10% off our Cardiosport Blue HRM strap throughout November 2013. To take advantage of this discount simply enter the code BLUE10 at our checkout before November 30th 2013. Why chose the Cardiosport Blue HRM strap? In order to measure heart rate variability (the small time gaps between heart beats) a chest strap monitor must transmit RR intervals. The Cardiosport Blue HRM strap was designed with this in mind and provides ECG accurate information which is why we recommend this model to ithlete users. 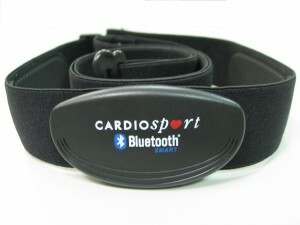 The Cardiosport Blue is available here! Don’t forget to use the code BLUE10 for 10% off before November 30th! Boasting in excess of 700 hours battery life the Cardiosport chest strap monitor will last 3 or 4 times longer than its competitors. In fact, with average use (up to an hour and a half per day) the battery will last between 18 and 24 months. After you do manage to exhaust the battery it can be easily changed by the user. The high quality soft strap is comfortable and flexible without compromising connectivity. The electronic module is also removable leaving the strap itself suitable for washing. As we continue to deliver a wider range of heart rate variability capable sensors we have made it easier to select your preferred sensor. After opening the new ithlete v2.3 app, you now have the option to choose your sensor via the ‘Edit’ screen, which will then be saved for future use. If at any stage you then wish to upgrade your sensor you just need to re-select the corresponding option on the ‘Edit’ screen. You will probably notice from the new ‘Sensor’ options on the ‘Edit’ screen that we have a new product coming soon; the ithlete Finger Sensor. To be released early in the new year we are delighted to announce this revolutionary heart rate variability sensor…full details here! This release brings a number of updates which will improve the all-round experience for those using the ithlete Team App. We’ve added the ability to log in/out of your Team account – those who have accidentally deleted a player will know how valuable this is! Training load, daily, weekly and monthly indicators are now automatically uploaded to the Team App with each measurement… and these values now get displayed on the Dashboard making analysis much easier at a glance! I can’t make Bluetooth HRM strap to work with ithlete app on Android. I have tried on Nexus 4 and Nexus 5 running KitKat. The app can see the strap, tries to connect to it, then says either “Bluetooth Smart sensor disconnected” or “Bluetooth HRM incompatible”. If I try connecting the HRM strap through system Bluetooth settings, the device is detected, but then Android is asking me for a pairing PIN, which I couldn’t find anywhere. The HRM device lacks any pairing buttons either. I have the following serials or something printed on the back of the sensor: “13513S” and “1311L1103”. The ECG adaptor works fine. Any help is highly appreciated. I can send you logcat data if you need it. Just to let you know I’m looking in to this and will get back to you asap. Would also be useful to know which Bluetooth HRM strap you are using please? Did anyone ever resolve this issue? I am having the same problem a year later. You need to connect the Bluetooth HRM directly from within the app rather than pairing first with the phone. To do this open the app and select Settings > Choose sensor. When you select Bluetooth ithlete will search for straps in range. I can not connect my Polar H7 HR strap to ithlete on Nexus 10 with Android 4.4.2. I can not select the BLE option in the sensor configuration dialog. I forgot to ention that other applications are able to connect to the Polar H7 through Bluetooth. Bluetooth Smart HRM straps can only pair with one app at any time. So as you have previously used the strap with other apps please try disconnecting from them before attempting to pair with ithlete. If you still have no success please email us ithlete.support@myithlete.com. 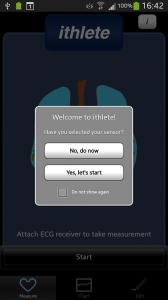 Will ur app work with a Garmin or Polar HRM strap device? I have new ones of each that I know work (I don’t use them with my other android phone apps) but ithlete can’t pick them up. Will it only work with the type strap u advertise? We have a list of compatible HRM straps here http://www.myithlete.com/faqs/. Polar straps are compatible! If you are still having trouble there is also some troubleshooting steps on the same page. Hi Laura. Just to be clear, are you saying that garmin hrm run straps are not compatible? No, ithlete isn’t compatible with ANT+ (the standard Garmin uses).